We are not happy with Management Reporter - can anyone give be great alternatives that have worked well for them? I understand your frustration. We have had mixed results with MR. Customers who are happy with it are either those with a simple chart of accounts, those not using AA, or those who are using AA but had sufficent budget to let us develop heavy customization to produce the analysis they wanted. It will make a big difference if you are or will be using AA. If AA is not to be used, replacing MR will require an intimate knowledge of the database structure (which is not complicated). A free tool that you can use if SQL Server Reporting Services. My own preference for customers who have started investing in SalesPad (for other reasons than financial reporting) is to use the Reporting and BI Tools within SalesPad, which I find are more elegant and faster to develop and deploy. I "grew-up" on FRx so I can do almost anything in Management Reporter - and have. However, it is a difficult interface and easy for users to get stuck spending time getting them to work. So I can understand the frustration with the product. I do like Jet Reports and I usually push it as an MR replacement. I have never heard of ActivReports until today - good to know. Based on Jo's endorsement, I would assume it is great and easier to use than MR. Sorry. AA stands for Analytical Accounting which is a standard GP module that allows you to create dynamic dimensions on top of your GL and use them in your operational transactions and then report on them in your financial reports. The idea was good when ERP's could not give you unlimited operational dimensions like the way we have today. However reporting on AA data is complex and is not intuitive. Modern ERP's (including GP with specific Add-on's) allow you to build your analysis dimensions on the operational side so that you don't clutter your GL. I too, do not like... no I loathe Management Reporter. It is difficult, out-dated and far too rigid for the demands of reporting in this day and age. Here are links to two of my favorites. Jet Reports are AWESOME with a lot of bang for the buck. I also really love ActivReporter it is awesome, fast, and since it carries (like MR) only the need to look at "Financial" Information it is EXTREMELY reasonably priced, easy to use and also AWESOME. It really depends on what you are asking for from your reporting as to which solution is better - and there are other solutions, but these are my favorites! You are spending too many hours copying and pasting in order to compile the information you need, reducing resource effectiveness and wasting valuable time. Your data shouldn't suffer from the manual, error-prone task of piecing important financial and operational information together. Inaccurate reports impact the success of your business. For years, it has been a given that using Dynamics GP for your accounting needs meant acquiring an additional reporting package. These external tools can be slow, clunky and often expensive. ActivReporter provides an all-inclusive reporting experience with more visibility into your organization's financial data than ever before - all without breaking the bank. Tell us how you really feel, @Jo deRuiter!​ Stop trying to spare our feelings! @Belinda Allen loves (I don't think that's too strong a term) JetReports. ​And I got a quick demo of nQativ's ActivReporter a couple of Summit's ago. I'd been working with one of the SQL Server-based Multi-dimensional-model tools for financial reporting and budgeting and I knew something about the learning curve. ActivReporter is fast. Lots of other apps available: BI360, Prophix, Calumo, Tableau... Those aren't as inexpensive as JetReports and ActivReporter. But it would make a nice tag line for your sig! Jo & Steve have provided some good points & suggestions. Aside of Jet Reports & ActivReporter, there is also a product named Vivid Reports from a western Canadian company in ​Winnipeg MB. 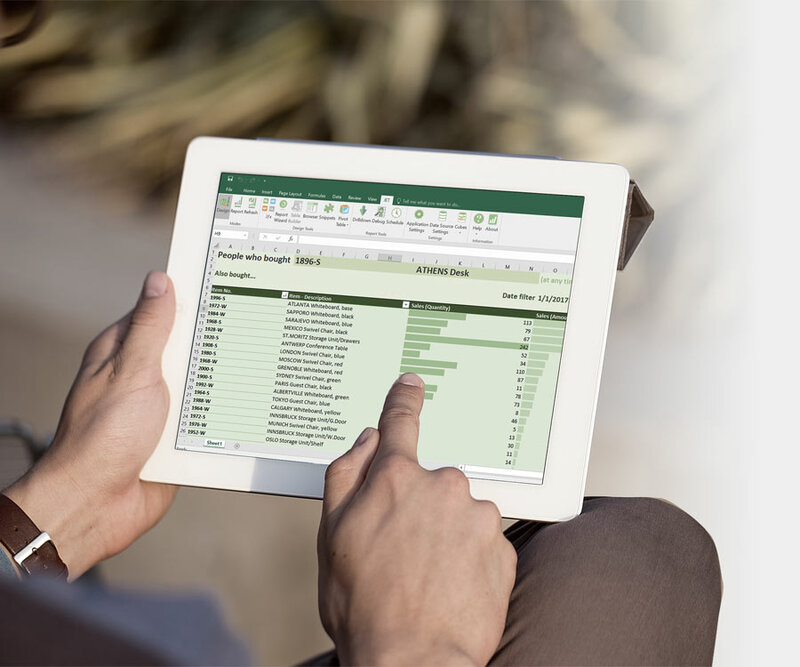 Their product fully integrates into Excel and makes creating Financial reports a breeze like JetReports, but much more powerful. I can put in touch with them if you would like a personalized demo. I have spent many hours look for the right product to replace MR. I have tested both Jet Reports and ActivReporter and found that I like the functionality and ease of use of ActivReporter. I recommend asking for a Demo and i know you will be impressed.